Nearly half of the College of Liberal Arts and Sciences’ incoming students express interest in scientific degree areas. To help support these academic pursuits and bolster UIC’s position as a premiere institution for students aspiring to a career in the health care field, the college has been assembling a prestigious cohort of endowed chairs focused on discovery-based research and scientific innovation in the natural sciences. The latest researcher to be recognized for advanced research and named LAS Endowed Chair in the Natural Sciences is Huan-Xiang Zhou, professor of chemistry and physics. Zhou’s extensive body of work explores the basic building blocks of life: proteins. His research group has pioneered theoretical, computational, and experimental research in molecular dynamic simulations, and created innovative models of the proton channel of the flu virus and glutamate receptors, which are important for learning and memory. The first of its kind in the college, the new LAS Endowed Chairs in the Sciences cohort is made possible by the investment of royalties received from a patent for the lifesaving HIV/AIDS drug Prezista. Developed by former chemistry professor Arun Ghosh, UIC’s intellectual property associated with this medicine is the most successful royalty-producing patent ever developed by faculty in the University of Illinois System. 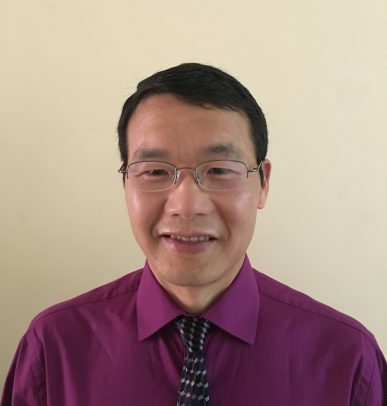 Zhou and his team are currently researching peptide self-assembly models such as those found in the Amyloid-B protein, which has future implications for decoding the causes of Alzheimer’s disease. His achievements include continuous funding by the NIH’s National Institute for General Medical sciences since 1998, and publication in some of the most prestigious scientific journals including Science, Nature Communications, PNAS and ACS Nano. Zhou, who came to UIC in 2017 from Florida State University, has been elected as a fellow of the American Association for the Advancement of Science and a fellow of the American Physical Society. He is also a recipient of the highly selective Maximizing Investigator Research Award in 2016 for outstanding research in the life sciences. Earlier this year, Wonhwa Cho, professor and head of chemistry, was named the inaugural LAS Endowed Chair in the Natural Sciences. One of the two remaining endowed chairs will be in biological sciences and another one will be a dual appointment in chemistry and physics. Amiridis and Tantillo will officiate a formal investiture event and reception scheduled for 3 p.m. Oct. 1 in the Cardinal Room, Student Center East. The event, which will feature a special lecture by Zhou entitled “Adventure as a Detective of Protein Mysteries,” is open to the UIC community and general public. RSVP to lasevents@uic.edu.